Along the shores of Castle Rock Lake are dotted with public launch sites, and visitors can enjoy water skiing, swimming, sailing, and boating on its beautiful blue waters. Spectacular sunsets await along the many miles of wooded shoreline where 25,000 acres remain in their natural state. Fishing there are walleye, northern pike, bass and perch lurking just beneath the surface. ...Learn more here! 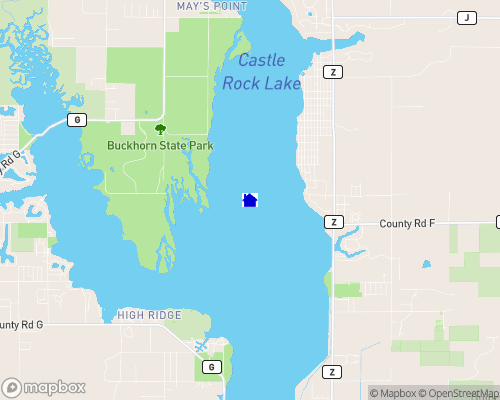 Along the shores of Castle Rock Lake are dotted with public launch sites, and visitors can enjoy water skiing, swimming, sailing, and boating on its beautiful blue waters. Spectacular sunsets await along the many miles of wooded shoreline where 25,000 acres remain in their natural state. Fishing there are walleye, northern pike, bass and perch lurking just beneath the surface. Depth of Lake: 30' ft.